Ubisoft has had a rough year. Game-breaking bugs on launch, day-one DLC controversies and review embargoes are only a couple of the problems that have arisen. With The Crew by developer Ivory Tower, Ubisoft is stepping out of its comfort zone, a MMO racing game. The Crew’s story is as cliché as they come. You play as Alex and your brother is the head of a gang. During the prologue he is killed and you get arrested for it. After a couple of years you get released to work together with an FBI agent to bring down the people behind your brother’s murder. Everything about the story feels like you played it before in some Need for Speed game or seen it in a Fast & Furious movie. The game never tries to get over the clichés, not even with the various characters that are introduced to you. It is lengthy however and does quite a good job at introducing you to the various aspects of the game. You can literally get lost within The Crew’s interpretation of the United States. Driving from the east coast to the west coast can take up to an hour, during which you’d only have seen a fraction of the map. The most impressive achievement here however is that you can discover the whole map without going through a single loading screen. All that comes at a price though. 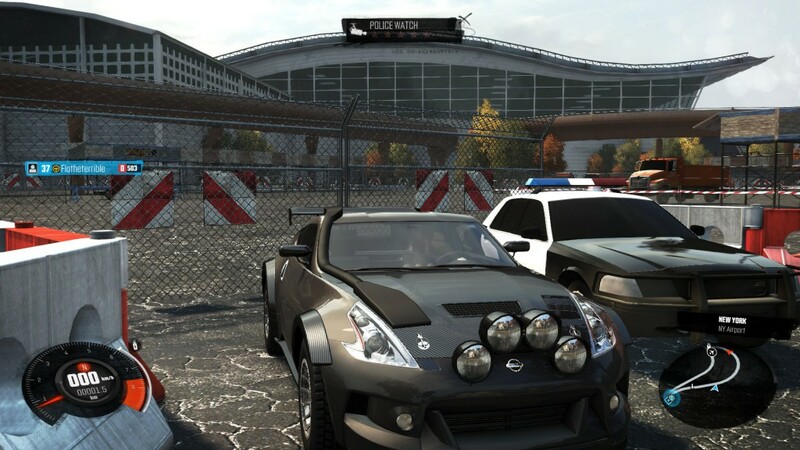 The graphical fidelity found in The Crew is nowhere near the other “next-gen” titles. While cars still look alright, the interiors are impressive even, all other assets in the game leave a lot to be desired. 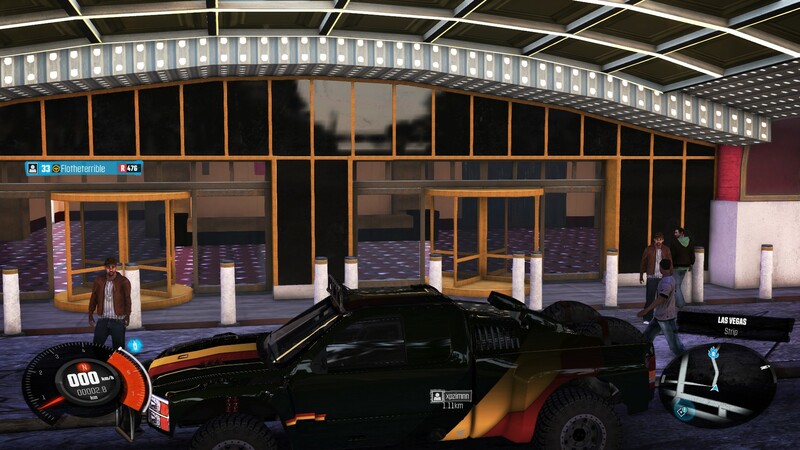 Especially buildings and non-playable characters’ cars lack detail. On consoles the game runs at 30 frames per second which is sad but common right now with console games while on PC there’s an option to run at 60 FPS. Sadly the FPS-lock can’t be turned off. Also some options weirdly enough can’t be toggled like the in-car camera animations, which can be very distracting at times. Cars sound good, which is one of the most important things for immersion. Annoyingly all the other sounds in the game sound off balance in contrast to the car sounds. Also conversations over the phone, in relation to the story, get repeated after each loading screen which will lead to you as a player often hearing the same conversations over and over again. The thing that I missed the most however was a decent music/radio system. Let’s get The Crew’s most promised, yet most disappointing, feature out of the way. It was advertised as a massively multiplayer online racing game. Rest assured, it is not. 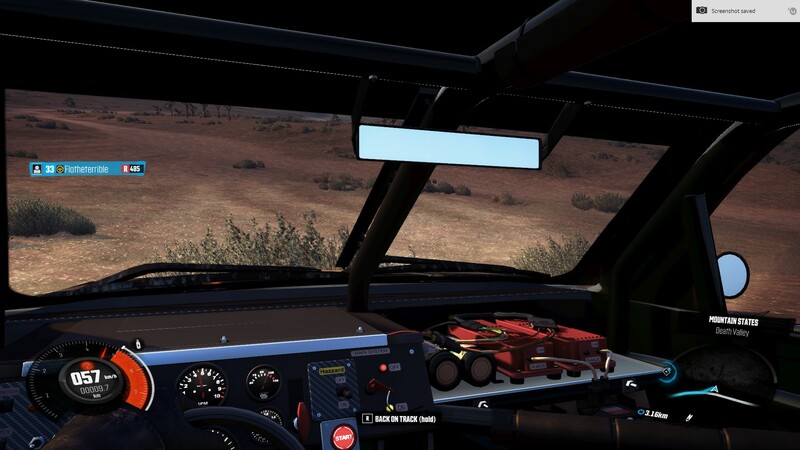 Never drive alone is what every trailer said, but it is what you’ll do most of the time. 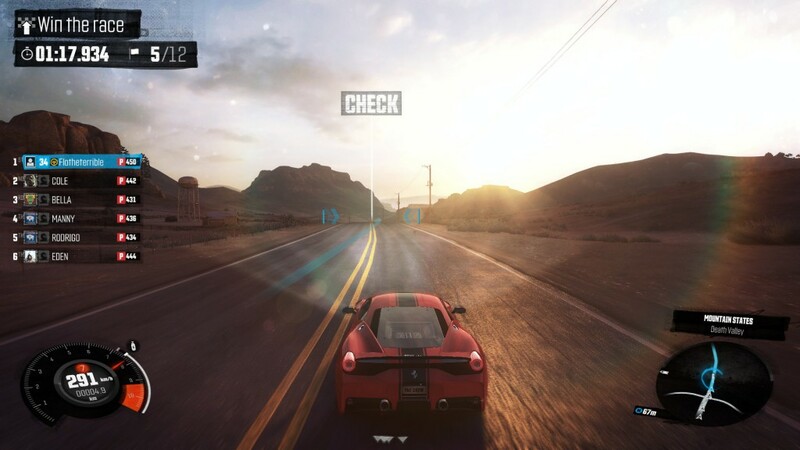 While the game requires you to be online at all times, it fails to match you up to other players while cruising around in a dynamic way. While sometimes you will encounter other players, the only way to really drive together with people is by knowing and actually adding them to your UPlay friendslist. Other online events were also disappointing with me trying to create a PVP event with the queue running more than an hour without any success. Let’s get to that driving now. Like most racing games, The Crew is enjoyed the most using a controller or a racing wheel setup. Most setups are supported and require no additional tinkering with options. There are however plenty of ways to get your wheel setup just right should the default not be okay for you. Force feedback is excellent and driving feels just right, better than you’d expect of an arcade racer. The way the cars handle can be altered with the difficulty level, there are 3 levels of driving aids to suit the needs of most players. The insane map is filled with plenty of things to do. Scattered throughout the map are of course Ubisofts’ signature structures: synchronization points. Getting to these points will reveal a part of your map, sounds familiar? There are hundreds of short skill events which will earn you performance parts. The events can be stay on the line or jump over the ramp and land as far as you can. The performance parts will increase the level of your car while grating performance boosts like acceleration and handling increases. Also every part of the map (there are 5) has collectible car wrecks which will get you a new car upon collecting all of them. Discovering landmarks will earn you some quick cash and there are also special faction races. A couple of hours into the game you will get to choose a faction which will unlock these events. These will be your primary way of earning Bucks (the game’s currency) because the game’s story missions won’t earn you a lot of those. Talking about those story missions, they include all normal race types you’d expect: sprints, lap races, follow a car, timed events and takedown missions. The problem with these races however is the AI. Both opponents and cops feel overpowering most of the time. No matter how fast the car is that you bring, other racers with a lower car level always manage to keep up. Cop chases though have to be the most frustrating thing in this game. No matter which terrain you’re on, they apparently have super cars. What to spent your Bucks on? Cars of course! There’s a nice variety of cars out there but that’s mainly thanks to the fact that every car can have multiple specs. These specs are Street, Dirt, Performance, Raid and Circuit. Turning a car into a certain spec will change its appearance and performance radically, especially the Raid spec looks quite impressive. 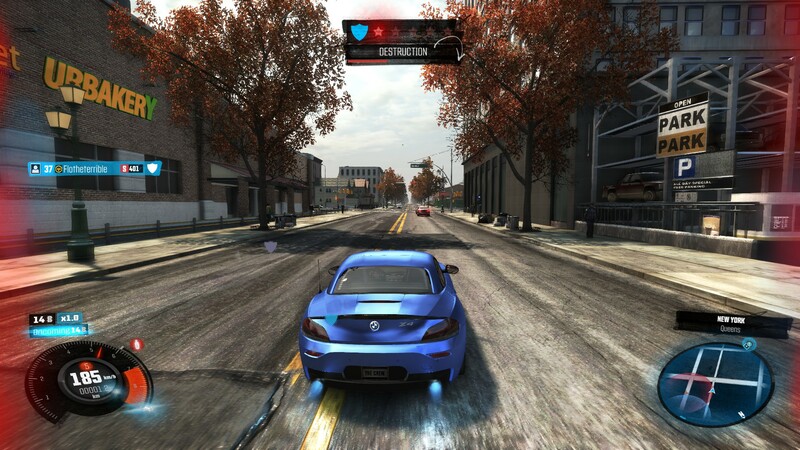 Furthermore players can customize their cars to their own liking in Tuner Shops. Options are limited however. Bumpers and skirts can be changed as well as other things like paint, stickers and interiors but there’s not a whole lot of variety. In the rare occasion you encounter another player and he’s driving the same car you are, chances are your cars are going to look pretty similar which to me defeats the purpose of customization. To pay for all this you can use Bucks but there’s also another currency, Crew Credits, which can be used to pay for cars like the normal Buck but also can be used to unlock performance parts. These parts normally have to be unlocked through progression but the Crew Credits can unlock those instantly. Here comes the kicker, this currency can be obtained through micro transactions within the game. While I’m glad everything in the game can be obtained while progressing through it, I’m very sad to see any form of micro transactions whatsoever in a AAA title. The one thing that The Crew has going for it is its immense world. Driving around it is a very satisfying experience which is also thanks to the excellent wheel/controller support. Sadly there are a lot of things that are less pleasing. The cliché story, dated graphics, micro-transactions (in a AAA-title??) and an annoying multiplayer mode are just some of them. If you enjoy the thrill of driving cars of all classes within an insanely large open world, The Crew will give you plenty of content to play with. For a more genuine racing experience you’re better off with a different game.